Lasting Tan After Sun MOISTURIZER 6 fl oz. Replenish and revitalize your skin with our soothing Moisturizer. The sun is hard on skin and you want it looking and feeling it's best. 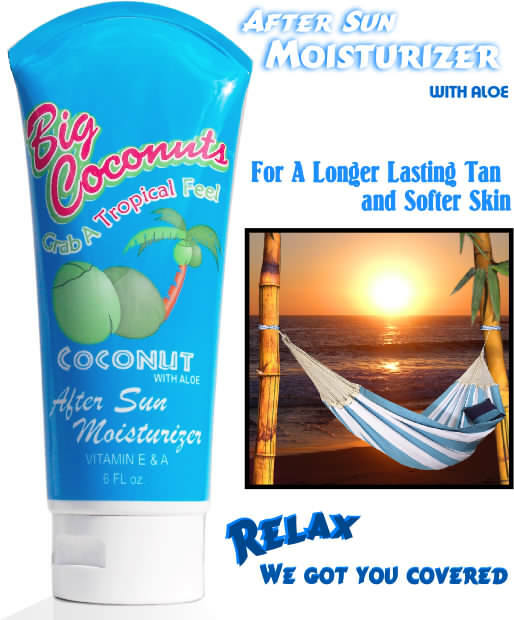 Big Coconuts moisturizer gives your skin that smooth and creamy feel of the Tropics and lets you keep your tan longer and your skin softer. Enriched with Organic Aloe Vera, Vitamin E & A, Coconut Oil, Sweet Almond Oil, (Anti-Oxident) Green Tea Leaf Extract, Chamomilla Extract, Marigold Flower Extract and our "Fresh Cut" Big Coconut Fragrance. Our Moisturizer is designed to sooth your skin as well as soften and maintain a healthy glow. Big Coconuts lotions are made from the finest botanical blends and formulated to give you the protection you need and the soft skin you deserve. 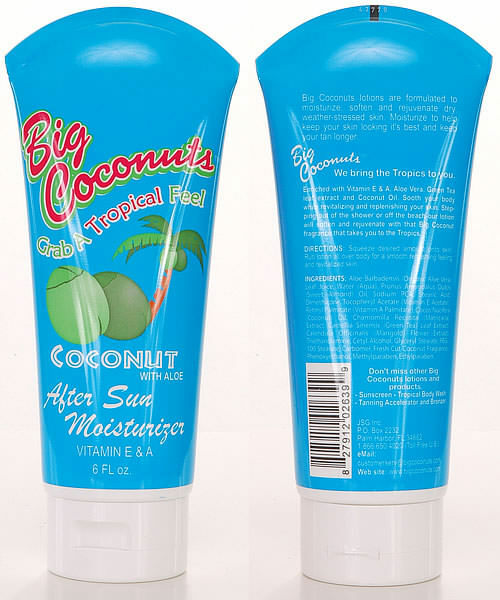 High quality lotions with a fun Tropical attitude. Big Coconuts has the best Coconut fragrance on the market.